The Origins of Richard Prince, the first member of the family to reside in Clovelly, remain a mystery. The first time we find him mentioned in the Parish Church Registers is on 17th September 1787, when he married Susan Thorp. 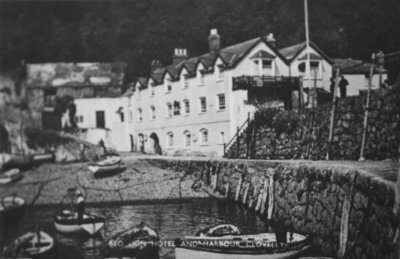 The residence of both bride and groom was given as Clovelly, but to be described thus one had only to live in the parish for the previous 28 days. What is significant is that the two witnesses were Gerrard Hussey and James Hamlyn Jr., the same James Hamlyn who was to build Hobby Drive. The only thing we know of his early life is that he was born in late 1759 or early 1760. Susan, or Susanna, Thorp is not a mystery. The Parish Registers show that she was baptised in Clovelly on 15th August 1760, the daughter of William Thorp. Records show two brothers, Andrew, four years her senior, and George, some five years younger. Susanna also had a sister, Priscilla, born in 1762. The newly-weds soon started a family, and their first son was baptised on 14th July 1788. The boy was baptised Barnard, but later in life this became altered slightly, and many records show his name as Barnet. A year later the couple was blessed with a second son, named Richard like his father, who was baptised on 28th August 1789. Another son, William, was born sometime in 1790, although there appears to be no record of his baptism. 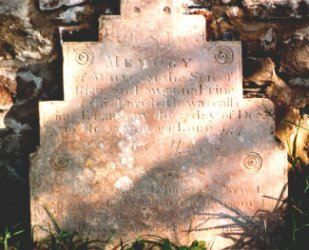 Sadly the boy died seven years later, in December 1797, and a headstone leaning against a wall in the churchyard commemorates this. The final addition to the family was a daughter, Susan, who was baptised on Christmas Day 1792. Whilst his family was increasing and growing, Richard was busying himself with the serious business of making money, and several documents exist which record his methods and successes. The Devon Quarter Sessions records held at the County Record Office in Exeter include Alehouse Licences issued annually by the Justices of the Peace, and these show that on 11th September 1787, six days before his marriage, Richard Prince obtained his first such Licence. At the time four Licences were issued for Clovelly, the other three being granted to John Maine, Catherine Warmington arid Jane Hodge. Each victualler had to pay £10 for the licence, and in addition two people had to stand surety for them for £5 apiece. (From 1807 only one person was required, but they had to produce the sum of £10.) Richard's first sureties were stood by John Wills, and Gerrard Hussey who was to be a witness at his wedding. Also of interest is that one of the three Justices of the Peace who granted Richard his first Licence was James Hamlyn. This was probably James senior, the father of Richard's wedding witness he records show that Richard continued to be granted an Alehouse Licence until 1821, since when no more records exist. The document for 1798 also names the Alehouses; in Clovelly John Main occupied the Red Lion, Henry Jewell the Black Horse, and Richard Prince a second Red Lion. 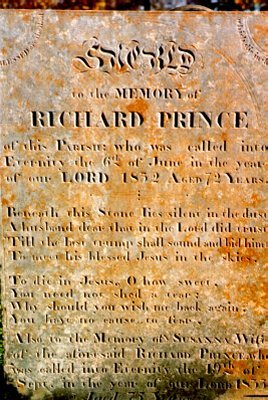 In 1802 Richard's name was given as 'William Prince' and in 1809 as 'Richard Prance'. At various times his sureties were stood by Michael Trace, John Bridgman, Charles Smith, John Bale, John Dyer, Richard Curtice, George Lance, John Hutchings, James Elson, Nicholas Jeffrey, William Nicholls, John Ashton, Thomas Short, Richard Hamlyn, James Bailey, Jonathan Jewell 'Yeoman', and John Seldon. In 1804 and 1818 Richard stood surety for himself. Another set of documents record the Land Tax assessments for Clovelly between the years 1793 and 1808 and show Richard as occupying a property on the Quay. The 'Red Lion' for which he was granted an Alehouse Licence was apparently the same one as exists today. Land Tax as a way of raising money by central Government had been in existence since about 1690, and was not finally abolished until 1963. During the period in which we are interested the value of Richard's abode remained at 7s ½d. The owners of the property changed, however. In 1793 it was owned by James Wills, in 1794 and 1795 by the New Granery (possibly the Brewery), and in 1796 and 1797 by a Mrs Whitefield, who appeared again in 1799 and 1800. In 1798 and from 1801 onwards, the Lord of the Manor, Sir James Hamlyn, was given as the owner. In 1799 it is interesting to see that Richard's position in the village was such that he, along with one William Deane, were responsible for making the assessment of property values in Clovelly. Further evidence of Richard's occupation of publican appears in some of the Churchwarden's accounts. The earliest record of his making money appears in an entry for 1789, when he was paid 1s 4d for ale. In the accounts for 1797/8 Richard, along with Mr Main and Mrs Jewell were paid 16s for ale for men working on the church, and an individual payment of ls 6d was made to Richard. The account for the following year shows a change of commodity when he was paid 1s for a rope. In order to transport coal, and probably lime, across the Bristol Channel, Richard had branched out into ship owning. Although the names of boats owned by Richard at this time have not been traced, on 16th March 1808 he registered at Bideford as co-owner with William Hockin of Clovelly and Thomas Popham of Appledore a brigantine named the JOHNS. This ship had quite a history in itself, having been built in 1797 in Maryport as a schooner and registered in Kirkudbright, Scotland. In 1805 she was re-registered at Pembroke, and then, as mentioned, at Bideford. She was not a particularly large vessel, being 51ft in length and weighing some 50 tons. The original registration document was subsequently lost and she was issued with a new one by Bideford in August 1815. The JOHNS was finally broken up at Clovelly, the registration being cancelled in December 1617. The 1815 registration shows that Richard's eldest son Barnet was the master, as indeed he had been for some years, as an entry in the Port of Bideford daily record of ship movements shows that the JOHNS, Master Barnet Prince, entered port on 12th May 1811 from Clovelly with a cargo of corn, sailing again for Hartland two days later with an identical cargo. Incidentally, this is the only record of a Prince-owned ship using Bideford harbour in records extending over several years. At about the same time that the ageing JOHNS was being disposed of the family was having a new vessel built at Clovelly by Thomas Barrow. The new ship, the AGENORIA, was registered at Bideford on 26th October 1818, but since Richard junior was the registered owner, we will return to her in the next chapter. As he was now almost 60 Richard may well have decided to retire from business and hand over to his three children although, as we have seen, he did continue to be granted an Alehouse Licence until at least 1821. If he did make this decision he enjoyed a fairly long retirement, as he did not die until 1832, on 6th June, at the age of 72. He was buried in the village churchyard ten days later. His widow died three years after him, aged 75, on 19th September 1635. The couple had been married for almost 45 years, and are commemorated on a headstone which is still easily legible.